Definition at line 38 of file listener_fmod.h. Definition at line 44 of file listener_fmod.cpp. Definition at line 50 of file listener_fmod.cpp. Definition at line 103 of file listener_fmod.cpp. Definition at line 142 of file listener_fmod.cpp. Definition at line 129 of file listener_fmod.cpp. Definition at line 116 of file listener_fmod.cpp. Definition at line 55 of file listener_fmod.cpp. References LLListener::init(), mDistanceFactor, mDopplerFactor, and mRolloffFactor. Definition at line 89 of file listener_fmod.cpp. References LLVector3::mV, NULL, and LLListener::orient(). Definition at line 135 of file listener_fmod.cpp. 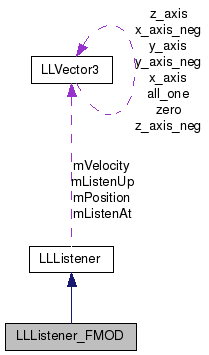 Definition at line 122 of file listener_fmod.cpp. Definition at line 73 of file listener_fmod.cpp. References LLListener::mListenAt, LLListener::mListenUp, LLVector3::mV, NULL, and LLListener::setPosition(). Definition at line 109 of file listener_fmod.cpp. Definition at line 81 of file listener_fmod.cpp. References LLListener::mListenAt, LLListener::mListenUp, LLVector3::mV, NULL, and LLListener::setVelocity(). Definition at line 65 of file listener_fmod.cpp. References LLListener::mListenAt, LLListener::mListenUp, LLListener::mPosition, LLVector3::mV, NULL, and LLListener::translate(). Definition at line 43 of file listener_fmod.h. Referenced by getDistanceFactor(), init(), and setDistanceFactor(). Definition at line 42 of file listener_fmod.h. Referenced by getDopplerFactor(), init(), and setDopplerFactor(). Definition at line 44 of file listener_fmod.h. Referenced by getRolloffFactor(), init(), and setRolloffFactor().